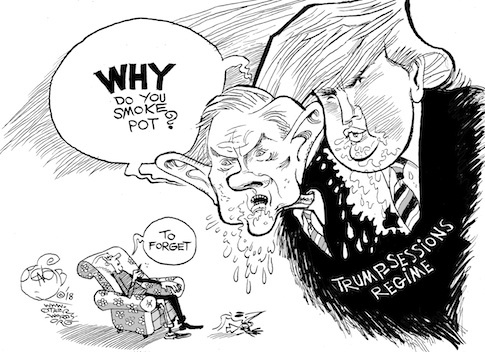 Jeff Sessions wants to crack down on legal marijuana, the only thing getting some people through this administration. As we go into a new year, I have a resolution. I’m going to speak up more when men do things that make me uneasy. Take the other day, for example. I ran into my neighbor while coming home, and we stopped to chat. Before we parted, he touched the back of my neck and kind of massaged it for a second. Not knowing what that meant, or what to do about it, I did nothing. I pretended it didn’t happen. Denial works, right? A few days later I ran into him again. Again we chatted, and he massaged my neck for a second or two again. What? Seriously, I would never, ever do that to someone I wasn’t dating. Why is he doing that? He isn’t being aggressive, exactly. My neck isn’t an erogenous zone. He isn’t doing anything else. And I want to be friends with this guy. He’s a nice guy. I don’t look forward to the awkward conversation when I tell him to knock it off. I don’t want to harm our friendship. That’s why I’ve said nothing. But the truth is, this was how it started with the first man who sexually assaulted me back in college. It started out with just some unwanted touching. In that case, he held my hand. There were more red flags with the guy in college. I’d yank my hand away, he’d take it again. Rinse, repeat. Ultimately that escalated to an actual assault. The perpetrator is now a pediatric neurologist. With the #MeToo movement, I’ve considered telling his employer. But is it worth ruining someone’s career because he assaulted me nearly two decades ago? I don’t know. But I do know I’m going to have to speak up to my neck-rubbing neighbor. Most men aren’t rapists. But when women don’t tell men that their behavior makes women uncomfortable, the sad truth is that men may think what they’ve done is okay — even though it’s positive consent they should be looking for. Why don’t we speak up? Often men become defensive. Some think that they’re the arbiters of whether they’ve made us feel uncomfortable or unsafe. That’s ridiculous. If a woman says she feels uncomfortable, then that’s how she feels. I know I’m not the only woman who will start speaking out more, but men need to listen when we do. And please, guys, be more conscious of your actions. Don’t call a woman you aren’t dating names like “sweetie.” And don’t assume we want any touch other than a handshake — even when we’re too uncomfortable to say otherwise. And when we do tell you what we don’t like, listen. If you feel yourself getting defensive, work through your feelings, and then listen. Don’t verbally attack someone for having the courage to tell you the truth. Stop using your sexual conquest of women as a measure of your manhood. Women are people, not objects. The only “game” you need is to act like a human being and treat us like humans too. 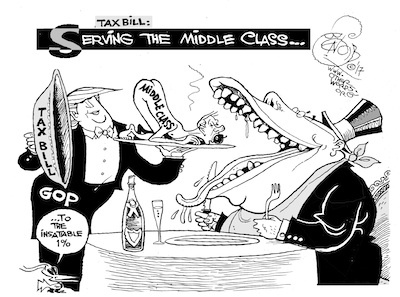 Serving the Middle Class … To the 1 percent. Before the gun lobby or its sycophants in Congress bring out their usual talking points for why we can’t ever have common sense gun reform, I’d like to shoot one of them down. No pun intended. We just saw what happens when a bad guy with a gun is met by a good guy with a gun. In Sutherland Springs, Texas, when a mass shooter attacked churchgoers, he was eventually confronted by another armed civilian. But before the good guy got there with his gun, 26 people were fatally wounded. 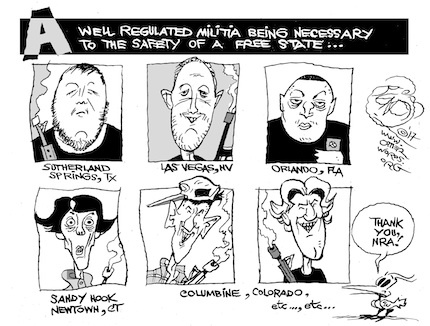 A Well-Regulated Militia – Actually, hold the regulation please. I’ve already heard discussions about fixing the problem by having more people bring guns to church, as the attorney general of Texas recently suggested. What about other ways to prevent gun deaths? How about any solution other than “more guns”? Every time I hear discussions about one reform or another — universal background checks, banning high capacity magazines, banning assault rifles, etc. — I hear the exact same talking point: Criminals can get around those rules. You could ban assault rifles, or the high capacity magazines that allow people intent on mass murder to shoot more bullets before they need to stop to reload. Perhaps some criminals would just get them illegally. Not all mass shootings could have been prevented by background checks. For example, the Sandy Hook shooter stole guns from his mother, who legally acquired them. Background checks wouldn’t have stopped him. Here’s the thing: These hypothetical arguments don’t need to be hypothetical. We can study them and make an informed choice. Which reforms will simultaneously preserve freedom for hunters, gun enthusiasts, and other law abiding citizens who want to own firearms while also keeping guns out of the hands of criminals? If there’s any will at all to reduce the death toll from guns in this country — more than 33,000 deaths a year — no doubt the country that sent a man to the moon can figure out how to do it without violating citizens’ rights. Furthermore, just because a law may not prevent all shootings doesn’t mean it won’t prevent some shootings. I’ve even heard a gun advocate say that regulation won’t work because it would only stop people who are too stupid to get around them from obtaining a gun. You know what? That sounds good to me. If we can prevent every single shooting perpetrated by a stupid person, I’m for it. That’s still fewer people dying overall. It won’t get us down to zero, but refusing to do anything just because it’s a partial solution is ridiculous. Each little bit of progress we make is a human life saved. It’s an entire family whose lives aren’t torn apart and changed forever. It’s two fewer grieving parents and four fewer grieving grandparents. It’s more children who grow up with their parents alive. I don’t have a stake in which method we use to reduce gun violence so long as we pick something that works. It would be nice if law-abiding gun enthusiasts would help. So let’s actually look at the data to find out how it can best be done. In fact, let’s lift the congressional ban that’s prevented the Centers for Disease Control from examining a lot of that data for the last 20 years. Preferably before another year passes and another 33,000 Americans are dead.